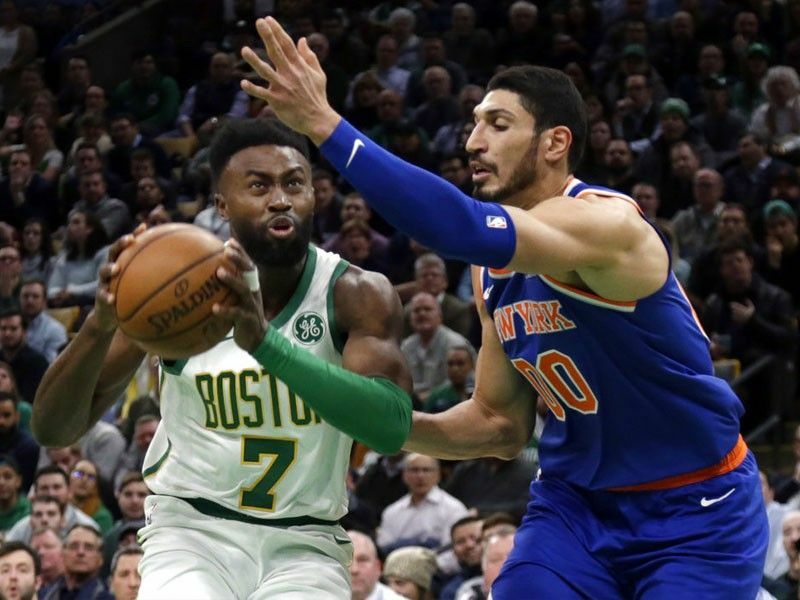 Boston Celtics guard Jaylen Brown (7) drives against New York Knicks center Enes Kanter (00) during the first quarter of an NBA basketball game Thursday, Dec. 6, 2018, in Boston. BOSTON — Kyrie Irving scored 22 points before leaving the game in the final minutes nursing his right shoulder, Al Horford had 19 points and 12 rebounds, and the Boston Celtics coasted past the New York Knicks, 128-100, on Thursday night (Friday Manila time). Jaylen Brown returned after missing three games with a bruised lower back and scored a season-high 21 points. Jayson Tatum added 17 for Boston, which won its fourth straight game and exacted a bit of revenge for a November 21 loss to the Knicks. The Celtics, who went to the Eastern Conference finals last year, were expected to be one of the league's top teams after getting Irving and Gordon Hayward back from injuries. But the November 21 loss in Boston to the Knicks was an early sign that something was wrong.